The holiday weekend distraction caused investors to miss the massive gains in these hot penny stocks. In fact, one of these penny stocks netted investors a 40% gain before the weekend. In just a moment, we will discuss why these top penny stock performers provided such huge gains in one day and take a closer look at the companies behind the stocks. First, we want to share with you two of the best strategies for trading penny stocks. These strategies can help you avoid scams and bad investments that are so often associated with penny stocks. 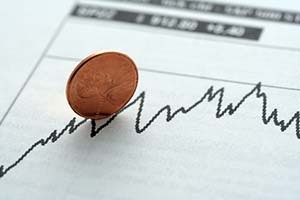 When looking for the best penny stocks to buy now, look for companies listed on major exchanges. The Nasdaq and NYSEMKT exchanges have tougher requirements for penny stocks than the Pink Sheets or Over-the-Counter Bulletin Board. For example, a company listed on the Nasdaq must have assets totaling at least $80 million. The NYSEMKT also has stringent requirements, as a company must have at least $750,000 in revenue in two out of the last three fiscal years to be listed. As part of your research process, analyze a company's annual filings. Filings are available to the public on the website for the U.S. Securities and Exchange Commission. A 10-K form will provide you with insight to the company's earnings, assets, and liabilities. The filings will also let you know how much debt a company is in, which helps indicate if its stock is a good long-term investment. Now that we've reviewed two of the best strategies for investing in hot penny stocks, let's take a look at some of the biggest gainers from last Friday, May 27. Hot Penny Stock No. 1, Vivint Solar Inc. (NYSE: VSLR): Vivint Solar was founded in 2011, and it provides solar energy to commercial, residential, and industrial clients in the United States. Shares skyrocketed 40% last Friday after analysts at Deutsche Bank AG (USA) (NYSE: DB) upgraded its stock rating from "Hold" to "Buy." The DB analysts also upgraded their price target for VSLR from $3.50 to $7.50 per share, stating Vivint's tax equity funding is improving and the share price is unjustly depressed. VSLR opened this morning at $3.76. It's down 60.46% year to date. Hot Penny Stock No. 2, C&J Energy Services Ltd. (NYSE: CJES): C&J provides production services for the oil and gas industry, primarily in North America. C&J provides well support, well construction, and well completion services for oil and gas exploration and production companies. CJES climbed 24.88% Friday, although there wasn't any direct reason why this occurred. Analysts at Thomson First Call see a lot of upside in this stock, though, and have a one-year price target of $1.23. That's an increase of 136% from today's opening price of $0.52. CJES is down 87.39% so far in 2016. Hot Penny Stock No. 3, Violin Memory Inc. (NYSE: VMEM): Violin Memory supplies and develops memory-based storage systems to improve the performance of servers and networks across the globe. The California company also provides flash storage platforms. Violin announced Q1 2017 earnings on May 24, and CEO Kevin DeNuccio provided a hopeful outlook in his conference call. DeNuccio stated Violin now has 10 companies on the Fortune 100 as customers. VMEM climbed 19.54% Friday and opened this morning at $0.43. VMEM is down 48.34% year to date. Hot Penny Stock No. 4, Diana Shipping Inc. (NYSE: DSX): Diana Shipping transports a large range of cargo, which includes coal, grain, iron ore, and other dry bulk cargoes. As of May 2016, Diana Shipping operated a fleet of 46 dry bulk vessels. On May 27, Diana Shipping announced it entered a time charter contract with Bunge SA for one of its vessels. The charter rate is $5,000 per day (minus a 5% commission), and the contract could last for five to seven months. After the announcement, DSX climbed 11.45% on Friday. DSX opened this morning at $2.54 per share and is down 37.47% year to date. Hot Penny Stock No. 5, North Atlantic Drilling Ltd. (NYSE: NADL): North Atlantic Drilling is an offshore drilling contractor in the North Atlantic region. It primarily offers harsh environment offshore drilling services in the United Kingdom and Norway. NADL reported Q1 2016 results on May 2016, and CEO Alf Ragnar Lovdal was optimistic about future contracts in the North Sea. Lovdal stated many new independent oil companies are looking to expand their operations or enter the North Sea for the first time. NADL climbed 9.9% on Friday and opened today at $3.46 per share. NADL is up 44.72% year to date.